There is much controversy surrounding the word I’m thinking of. You don’t hear it much out and about, but most know its meaning. It seems that it’s always used in a negative way, often as an insult, and has been known to induce attitude shock or offence (so much so that artistic expression of the concept is, in certain countries, considered so inappropriate that it’s actually illegal). This is somewhat unusual, as it acquired the power to insult when it was never originally supposed to, and became synonymous with words and ideas to which it once bore no relation. In fact, when it first came into being, it was often associated with something rather wonderful, but if you tell someone today they’re a complete c______, I doubt you’ll get a positive response. Yes, communism has been a controversial word for a long while. Somewhere down the line, it became a well-known enemy, and we saw it as such for the remainder of the twentieth century. We even created brilliant works of propaganda on the concept; perhaps it was coming to overthrow your democracy and install a dictatorial puppet state, or maybe it was (and there is truth behind this, though aggression was obviously far from one-sided) on the verge of flattening New York with a nine-megaton bomb, but it was a monster all the same. Society came to agree that whatever the communists were planning, something bad would happen as a result. The question is, however, when did this all start? Ever since 1917, many saw in communist Russia a foe. This can be traced back to the Allied intervention in the Russian Civil War, a conflict that occurred just after the catastrophic defeats of World War One. But the communist terror and angst that would later plague Europe and North America was, at that point, largely nonexistent; in these early years, the west was largely unaware of both the political terror and the military challenge the regime would later provide, and thus, to call yourself a communist probably didn’t mean a great deal, for communism was really just another radical idea. I once read an American newspaper headline at the time of the Russian Revolution, which described the Bolsheviks as ‘extremists’, comparing them with ‘moderate governments’ before them. Whilst I definitely felt anti-Bolshevik sentiment expressed there, the article implied nothing significant or special about their cause – the only distinction it drew between the party that would later lead their future nemesis and the easily forgotten Provisional Government, which assumed power for a brief, eight month period before October, was a mere statement that one was radical while the other was moderate. In fact, many in the west were far more open to the prospect of communism than this. George Bernard Shaw, for example, even advised the British unemployed to travel to the USSR, under the impression that they would be given a job. It’s also known that the intelligentsia in the United Kingdom were a lot more sympathetic towards the Soviet Union than you might expect, and many respected their ideals in a way that would seem unimaginable during the years of the Cold War. This continued throughout the repression of Stalin’s era, and people still managed to find sympathy with his political system. I even heard that information regarding oppression in the Soviet Union was actually covered up by those able to do so, for fear that it may soil the image of Russia that many westerners undoubtedly clung to. 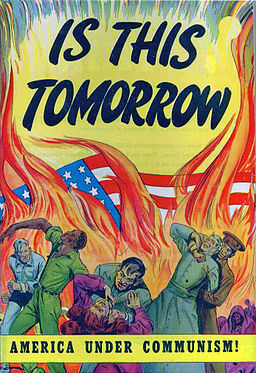 Only thirty or fourty years later, however, far from withdrawing information to preserve Soviet support, western governments would dress-up and dramatize reality in the Eastern Bloc almost to an unfair level, printing McCarthyist slogans in black, probably against a red background and a hammer-and-sickle to add a sinister quality. After the 1917 revolution, tensions did occur between the communist and capitalist world, but during the war something snapped, and relationships deteriorated almost to the level of sparking a World War Three. Communism, as a term, almost became synonymous with fascism, and I’m willing to bet that plenty don’t know the difference, which is strange, given that only a few decades previously, this word would have accurately described the views of many in the west. There isn’t one explanation for the change, nor for why it occurred at that moment, and on reflection, it may seem odd that the Cold War began in 1945 and not 1917. After all, an obvious explanation for the post-war tensions is the lack of any need preserve a situation of comradeship with the Soviet Union, once fascism had been finally defeated, but nor was there a need to maintain diplomacy throughout the ‘20s and ‘30s. It would also be easy to assume that communist aggression towards the west began only after the war, but this is again untrue; Lenin once referred to England as the Soviet Union’s greatest enemy, and Soviet military action in the then-British colony of India proves that such statements weren’t at all hollow. So, as I understand it, there is only one reason as to why perceptions of communism changed worldwide, this being military prowess. The USSR emerged from the war a highly capable country, and, if another conflict was to occur, the prospect of a western defeat was incredibly likely. Thus, though tyranny, repression and starvation were known prior to the war, they were largely ignored. Now that the west had a reason to fear the regime, however, a hatred for communism, with the assistance of these facts, was cultivated in no time. Whilst writing, I’m aware that I’ve come across as critical towards Soviet communism, and I am (by ‘Soviet communism’, I mean the Soviet Union after 1924), yet I’m a communist nonetheless, and I’m also critical of the west during this scenario, for I feel that the demonization of communism didn’t occur due to the oppression and failures it brought about where it was attempted, but simply due to the fact that it provided a potential enemy. This highlights a disgusting aspect of the political situation in the western world, this being the opportunistic tendencies of democratic, western governments, to ally or break with the worst kinds of states or governments when it suits their own interests, no matter how authoritarian, repressive, or simply wrong they may be (I’m not talking about a credible means-to-an-end kind of scenario – although this is likely a popular justification – I’m just talking about when it suits the interests of the international capitalists). To the western world, such an ideology wasn’t evil from the start; it only became so when it threatened capitalism. This was why the ‘C’ word gathered such negativity. Not because of careful observation of socialism’s many failures, but due to the material conditions the capitalist world found themselves in. In short, it was it only when it actually stood a chance that communism stopped being cool. If you liked this entry (or even if you didn’t!) I’d recommend reading its predecessor.